After exactly three months of roll overs, Mega Millions made a jackpot winner. A ticket holder from South Carolina will scoop the record jackpot for this lottery – $1.53 million. The cash value for this jaw-dropping prize is $878 million. Have you tried your luck with the Mega Millions lottery on October 23rd? Are you from South Carolina? If the answer is yes on both counts, check your ticket! The winning numbers of this historic draw were 28, 70, 5, 62, 65, and a Mega Ball of 5. There is one single ticket that matched all of them and it was purchased in South Carolina. That’s all we know so far! But, this is not the sole winner of the draw. In addition to the jackpot winner, the Mega Millions draw of October 23rd had 15,750,013 winning tickets. 36 of them matched the five main numbers. Their ticket holders will scoop a prize of $1 million each. Two other players added Megaplier to their ticket. This means that instead of $1 million, they will cash $3 million. Was It a World Record? With an estimated value of $1.6 billion, this Mega Millions jackpot was believed to be a world record. However, once the final calculations were done, the prize wound up standing at $1.537 billion. This means Powerball remains the world jackpot record holder with the $1.58 billion prize delivered in January 2016. Nevertheless, we are speaking about a record for Mega Millions and the largest win on a single ticket. The $1.53 billion jackpot breaks the former Mega Millions record worth $656 million dating from March 2012. We don’t know if we are talking about a syndicate win or a single ticket holder. But, one thing is sure: this ticket is worth more than Powerball’s former record on a single ticket – $758.7 million pocketed by Mavis Wanczyk in August 2017. Besides, the $1.537 billion jackpot is certainly number one in Mega Millions jackpot winners Hall of Fame. Why Did the Jackpot Amount Change? The Mega Millions officials estimated that the jackpot at $1.6 billion, which would have been an all-times record for US lotteries. But, the morning after the draw Mega Millions said the total ended up being $1.537 billion. A spokeswoman for the Maryland Lottery explained in a phone interview with The Associated Press that estimated amounts are calculated based on historical patterns. As about 70 percent of ticket sales occur on the day of the draw, it is quite difficult to forecast precise numbers. The final calculations usually translate into a boost in the jackpot’s value, but this time it went the opposite way. 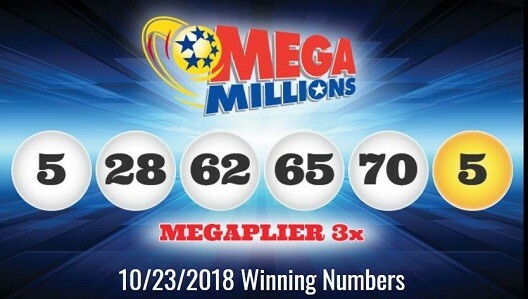 Moreover, this made the difference between Mega Millions being the world record holder for largest jackpot in the lottery history books or not. As of this morning, the Mega Millions jackpot has been reset to its initial value of $40 million. If nobody matches all the numbers, it will roll over until someone gets lucky again. So, don’t hesitate and play Mega Millions online! They might not make people queue for a ticket, but Mega Millions jackpots are life-changing any given day. In the meantime, the other American lottery giant – Powerball displays a $620 million jackpot. So, you still have the chance of becoming a multi-millionaire!